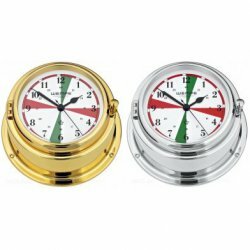 The WEMPE radio room clocks are ship clocks with classical design and clock faces with green and red radio sectors. These colours indicate the period of time in which only emergency calls are allowed to be made via radio communication and all other radio traffic must stop. The radio sectors from minutes 1 to 3 and 31 to 33 are marked in green and indicates the time of radio telegraphy, while the red sector, minutes 16 to 18 and 46 to 48, stands for morse communication. The WEMPE radio room clocks are not only battery-powered quartz clocks of a German company with 100 years of manufacturing experience, they are also a classical marine instrument whose functions are crucial at sea. Choose between a colourlessly lacquered or chrome plated enclosure with toggle clasp for easy opening and battery switching.